The ocean sunfish—a goofy looking fish with a vacant gaze and toothy grin—is one of the most ridiculed animals in the sea. It is - common mola (Mola mola), the heaviest known bony fish in the world. Adults typically weigh between 247 and 1,000 kg (545–2,205 lb). The species is native to tropical and temperate waters around the globe. It resembles a fish head with a tail, and its main body is flattened laterally. Sunfish live on a diet consisting mainly of jellyfish, but because this diet is nutritionally poor, they consume large amounts to develop and maintain their great bulk. We may not get to see one here ! The land of rising Sun, an archipelago of 6852 islands was in the news for wrong seasons after surviving the natural disasters of largest earthquake on March 11, 2011, measuring 9.0 and spawning of a deadly Tsunami after. Car, ships and building were swept away by a wall of water and the country had to count its dead. Sendai, a port city was worst affected. More than that, the World cannot forget the Fukushima nuclear disaster – Fukushima, strangely means ‘good fortune island’ lies about 250 km north of Tokyo and 80 km south of Sendai, known for nuclear power plants. The plants have boiling water reactors, a part of which had been shut down for maintenance. The remaining reactors were shut down after the earthquake but tsunami flooded the plant knocking the emergency reactors required to run pumps which cool and control the reactors. The earthquake in its wake prevented assistance reaching in time. The plant began releasing substantial amounts of radioactive material becoming the largest nuclear incident since the Chernobyl disaster in April 1986 and the second (after Chernobyl) to measure Level 7 on the International Nuclear Event Scale. Though they are prone to receive the worst of nature, Japan recoils back and Japanese scientists make many wonders. Read about this interesting invention – a fish, not any ordinary one, a sun fish that could swim to the core of the Fukushima nuclear reactor to investigate radiation levels after scorpion and snake shaped robots failed. The marine robot, nicknamed 'little sunfish', is about the size of a loaf of bread. It will swim in the Dai-Ichi plant in Fukushima, which was devastated by a tsunami in 2011. The technology, co-designed by Toshiba, has now been tested in Tokyo. DailyMail UK has this report that a swimming robot will be sent to investigate the damage at the Fukushima nuclear plant after a series of other probes died in the radiation. Since the disastrous earthquake and tsunami of March 2011, the Dai-Ichi complex has been blanketed in super-high radiation. Remote-controlled robots are key to the decades-long decommissioning process for the plant, but earlier attempts to inspect areas close to the reactors' cores have been halted because of the high levels of danger. Japanese developers say they plan to send the probe - nicknamed 'mini manbo', or 'little sunfish' - into the primary containment vessel of Unit 3 at Fukushima in July to study the extent of damage. The not so cute, but utility sunfish will also locate parts of melted fuel thought to have fallen to the bottom of the chamber, submerged by highly radioactive water and accomplish what a couple of other robots had failed to do earlier. The probe - about the size of a loaf of bread - is equipped with lights, manoeuvres using tail propellers and collects data using two cameras and a dosimeter radiation detector. During recent demonstration at a test facility near Tokyo, the probe slowly slid down from a rail and moved across the water. A team operated it remotely, with one guiding the robot while another adjusted a cable that transmits data and serves as its lifeline. Officials hope the probe can swim deep into the reactor to illuminate the area underneath the reactor's core. Japan hopes to locate and start removing fuel from the reactors after Tokyo's 2020 Olympics. In earlier operations, snake and scorpion-shaped robots became stuck inside two reactors. The scorpion robot's crawling function failed and it was left inside the plant's Unit 2 containment vessel. The other, designed for cleaning debris for the 'scorpion' probe, was called back after two hours when two of its cameras stopped working after its total radiation exposure reached 1,000 Sievert – a level that would kill a human within seconds. The plan had been to use the robot for 10 hours at an exposure level of 100 Sievert per hour. 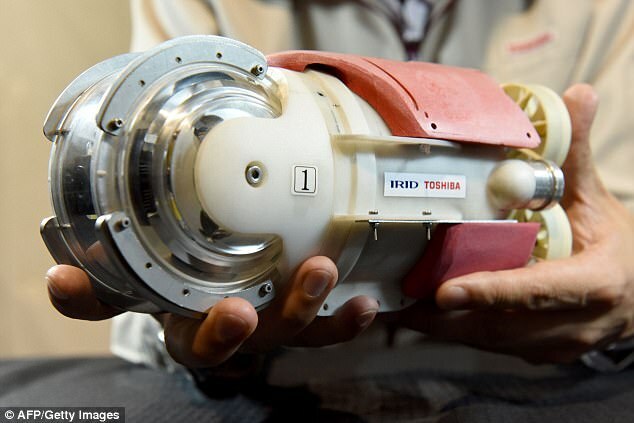 The swimming robot shown was co-developed by electronics and energy giant Toshiba and the government's International Research Institute for Nuclear Decommissioning. Scientists need to know the melted nuclear fuel's exact location and understand structural damage in each of the three wrecked reactors in order to work out the optimum, safest way to remove the fuel.